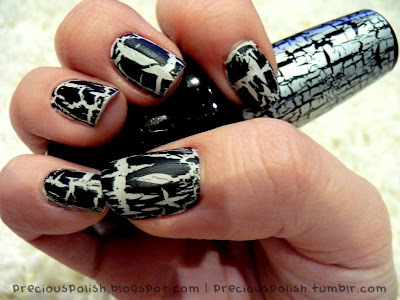 The thumb and ring finger have China Glaze For Audrey as a base with China Glaze Crackle Glaze Cracked Concrete on top. The other fingers have American Apparel Factory Grey as a base with China Glaze Crackle Glaze Crushed Candy. 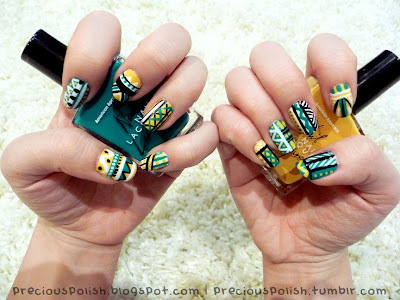 I did a tribal manicure last year but it wasn't very good. Seeing all the hype about them on Tumblr recently, I decided to try again. The colours remind me of Perry the Platypus! The teal colour is American Apparel Malibu Green and the yellow is American Apparel Manila. The white and black details were done with striping brushes. Here are my nails from Valentines Day. My red striping polish never fails to smudge! Ugh. I used American Apparel Coney Island as a base on the index, middle, and little fingers. For the thumb and ring finger, I used Sally Hansen Insta-Dri Whirlwind White. The red details were drawn with the offending striping brush and the mauve lips are American Apparel Dynasty. I used Color Club Pretty in Platinum for a base with OPI Black Shatter. 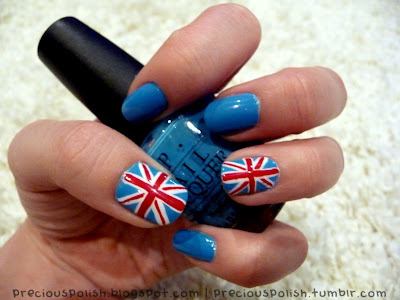 Topped it off with Essie Matte About You. This time I used American Apparel L'Esprit at the cuticle and American Apparel Coney Island at the tips. The duochrome is Sally Hansen Hi-Definition Byte. I used two coats of Seche Vite- big mistake! Look at the shrinkage! Here's my last post for tonight! This is one of my favourites. I created a regular periwinkle to grey gradient and topped that with a shimmery duochrome blue-purple gradient. 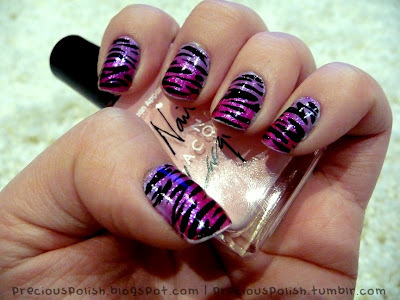 Blended everything with some easy zebra stripes. The first gradient was created by applying American Apparel L'Esprit on the entire nail and sponging American Apparel Factory Grey near the tips. The duochrome gradient was layers of Sally Hansen Hi-Definition DVD. The stripes were drawn with a black striping brush. The base is American Apparel California Trooper with black, red and white striping polishes. 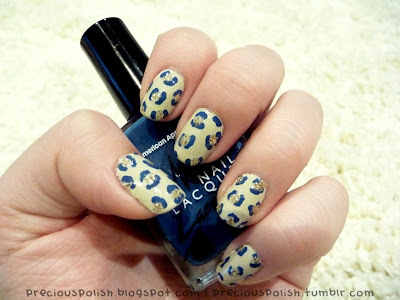 I used American Apparel California Trooper for the base colour and American Apparel Passport Blue for the leopard spots. The gold glitter is an unnamed Forever 21 polish.